Even after BJP bowed out of the race to CM in Karnataka, Congress is still vary of its opponent's attempts to lure its MLAs. According to CNN-News18, the party has decided to keep its flock together and all the MLAs are lodged at the Hilton hotel near Bengaluru. Kumaraswamy has said he will prove his majority within 24 hours of his swearing-in, which is scheduled for Wednesday. JD(S)' HD Kumaraswamy on Sunday said his meeting with Congress president Rahul Gandhi and UPA chairperson Sonia Gandhi on Monday will include discussions on Cabinet expansion and how to establish a stable government in Karnataka. "Tomorrow, I will be going to Delhi, where I will meet Sonia ji and Rahul ji. We will decide about Cabinet expansion. I will discuss everything with them on how to give a stable government for the next five years," he told ANI. Signs of discord have begun to appear in the JD(S) and Congress alliance with party leaders struggling to work out a coalition formula that satisfies both parties' MLAs. To iron out the existing differences, HD Kumaraswamy is rushing to Delhi to meet Sonia and Rahul Gandhi ahead of government formation in Karnataka. Speaking to reporters, Congress leader Jaiveer Shergill on Sunday said that the party hoped Prime Minister Narendra Modi will take action against BJP MLA who tried to indulge in horse trading ahead of the trust vote on Saturday. "We hope the prime minister orders probe into corruption which their MLAs were indulging in. The prime minister should prove to nation his commitment to fight against corruption and launch probe against those who called Congress and JD(S) MLAs, offered bribe to break the rock solid coalition," said Shergill. "High command will take decision. We, being a national party, supported JD(S) — a regional party — to uphold Constitutional principles and democracy. Keeping everything in mind, there ought to be a 'give & take' equation," says Mallikarjun Kharge on Karnataka cabinet formation. A day after BJP's BS Yeddyurappa resigned before the floor test took place, the new chief minister-designate JD(S)' HD Kumaraswamy confirmed he'll be meeting Congress chief Rahul Gandhi and UPA chairperson Sonia Gandhi on Monday. "Yes, tomorrow morning I'm going to Delhi. I'll meet Rahul Gandhi and Sonia Gandhi. Just 24 hours after the oath, I'll prove the majority," he told ANI. According to sources, senior Congress leaders Ghulam Nabi Azad and Ashok Gehlot will arrive in Delhi on Sunday morning and hold discussions with party chief Rahul Gandhi, before finalising the power-sharing arrangement with the JD(S) in the Karnataka government. The two leaders were stationed in Bengaluru to steer the party's strategy ahead of the floor test in the Karnataka Assembly on Saturday, where BJP's BS Yeddyurappa resigned as chief minister. "Everything will be decided in Delhi tomorrow (Sunday), when the top leaders of the party will hold discussions with Rahul Gandhi," a Congress leader told PTI on Saturday. Many prominent political leaders from the Opposition — like Congress president Rahul Gandhi, former Congress president Sonia Gandhi, West Bengal chief minister Mamata Banerjee, Andhra Pradesh chief minister N Chandrababu Naidu, BSP chief Mayawati — have been invited for the swearing-in ceremony. Soon after BS Yeddyurappa, the 2-day Chief Minister of Karnataka, resigned from his post after the speech at the Karnataka Assembly, Opposition leaders, including, Mamata Banerjee, Akhilesh Yadav, KCR, Chandrababu Naidu, Mayawati congratulated the Congress-JDS combine on their victory in the state and said that "democracy has won." Mayawati said that the use of money power and state machinery is not always helpful, as she asked the BJP to take lessons from the fall of its government in Karnataka. She further added that with the "defeat" in Karnataka, the BJP's "dream" of capturing every state has suffered a setback. "The governors appointed by them are under pressure of working according to the party," she alleged, adding that the dignity of the office they hold is under criticism. Governor Vajubhai Vala today invited Kumaraswamy, the leader of Congress-JD(S) joint legislature party, to form the government on Saturday. After meeting the governor, Kumaraswamy had said the swearing-in ceremony would take place tentatively between 12 and 1.50 pm at Kanteerava stadium on 21 May. 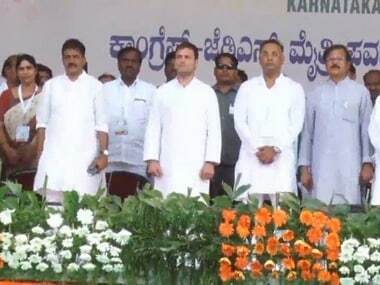 However, Kumaraswamy later in the evening said the swearing-in would be held on 23 May as 21 May happens to be the death anniversary of former prime minister Rajiv Gandhi, and therefore it would not be appropriate to hold the ceremony on that date. Rajiv Gandhi was killed in a suicide bombing in Sriperumbudur, near Chennai, in 1991. Of late, it seems like Congress president Rahul Gandhi has been making determined efforts to hone his skills in gaslighting India. Look at the manner in which he held the press conference after BS Yeddyurappa threw in the towel on Saturday. There was nothing wrong if Rahul tried to score political points by attacking the BJP for these efforts. But he went way beyond. He said, “prime minister is corruption” and referred to BJP president Amit Shah as an “accused in murder”. From a public platform, he brazenly lied on both counts, betraying a sense of entitlement that he could get away by saying anything. Rahul has a lot of worrying to do about the future of coalition politics and where it will leave his own party. Spreading aggressive falsehoods about Modi and Shah will not be enough to manipulate people’s psychology, like Amanda Carpenter (in her latest book Gaslighting America) says Donald Trump has succeeded in doing with America. But Rahul is not Trump, Modi is no political novice and India is not the United States. BJP sources told NDTV, that the saffron party knew it could not gather the numbers it needed to win the floor test and wanted to retain "moral ground". BS Yeddyurappa received the message from the on Saturday morning. Following the Supreme Court order which directed that live streaming the Assembly proceedings was the best way to ensure transparency, the party started preparing for a dramatic resignation speech before the trust vote. Doddalahalli Kempegowda Shivakumar is a Congress master strategist and Vokkaliga leader who ensured no horse-trading took place within the Congress ranks before the scheduled trust vote on Saturday. He is credited with keeping all the MLAs together, including ferrying them to Hyderabad and back, while ensuring the Congress-JD(S) alliance remained intact. He began his political career during his college days and by the time he was 25 years old, he contested against seasoned politician HD Deve Gowda in Sathnur but lost by a thin margin. "What happened in Karnataka yesterday was a win for democracy. BJP asking for some more time and governor giving 15 days time was a mockery of democracy. I would like to thank Supreme Court for its order, which upheld the democracy," said actor Rajinikanth. JD(S) spokesperson Danish Ali told ANI that the Congress-JD(S) alliance will last for a long time and grow stronger during the 2019 general elections. "The alliance of Congress and JD(S) will be really long. You'll see the alliance grow stronger in the Lok Sabha elections too," he said. While some may say that this a big blow to the Bharatiya Janata Party's (BJP) morale before the 2019 Lok Sabha elections, others argue that the story may be far from over for the once invincible Narendra Modi-Amit Shah combo. JD(S) chief minister-designate HD Kumaraswamy said he would meet Congress leaders Sonia Gandhi and Rahul Gandhi on Monday to extend his gratitude to them. "I will also discuss how many Congress and JD(S) MLAs will become ministers," said Kumaraswamy. He said a coordination committee would be formed to prepare a common minimum programme to implement the promises made by the two coalition partners. During the hearing, Attorney General KK Venugopal made a request to the bench to use microphones as the scribes standing behind in the courtroom were unable to hear the observations. The bench promptly obliged the attorney general and all the three judges switched on their microphones. Later, when the bench was about to dictate the order, Sibal again requested Justice Sikri, heading the bench, to switch on the mike and said, “As politicians we know how to make ourselves heard... “But we are not politicians. We don’t care,” the bench responded. The Supreme Court, which had to conduct emergency hearings on the bitter power tussle in Karnataka, on Saturday apprehended that it might be forced to do it again if this legal fight is not put to rest. Senior advocate Kapil Sibal, appearing for the Congress-JD(S) combine, at the outset expressed his regret to a three-judge bench headed by Justice AK Sikri for being forced to sit on the first day of summer vacation to hear its plea against pro-tem speaker KG Bopaiah. “First of all, I must apologise to the bench for this inconvenience of assembling on a Saturday,” Sibal said. “That is what we were also talking about,” the bench said.
" Na khareedunga Na khareednedunga "
The rise of Janata Dal (Secular) in Karnataka may act as a platform to unite opposition parties, especially the regional parties to play a bigger role in the national arena during parliamentary elections in 2019, JD(S) has indicated. Indicative of this is the invitation extended to leaders of regional parties to attend the swearing-in of the JDS-Congress coalition government in Karnataka. In his first comments after BJP leader BS Yeddyurappa resigned as the chief minister of Karnataka on Saturday, BJP chief Amit Shah maintained the party did not indulge in any manipulation, and said rather it was the Congress which not only indulged in horse-trading but has "bought the entire stable". "I can't comment on how long this government will be able to work. But governments formed by such unholy alliances are unlikely to work for long," Shah said. On Saturday, at 11 am, the Assembly bell rang, and all elected MLAs began taking their oaths. During this time, BJP MLA from Molakalmuru, B Sriramulu, kept moving in and out of Assembly hall, looking uncertain, reported The News Minute. He disappeared for nearly 30 minutes, and was eventually joined by other BJP MLAs including Jagadish Shettar, CT Ravi and MPs Shobha Karandlaje, Ananth Kumar and Sadananda Gowda. At 12.30 pm, Sriramulu walked back in and placed a stack of papers in front of Yeddyurappa, who looked happy till then. Soon after, the former chief minister left his seat and went into his chambers. That's when murmurs of Yeddyurappa stepping down began flitting around. Is playing second fiddle to regional parties in states like Bihar, Uttar Pradesh and now Karnataka (which it ruled till a week back) going to be the new template for the Congress? In some sense, it could serve Congress' avowed purpose of keeping the BJP away from power wherever and howsoever it can. But, will that be of value to the party in the longer run, in terms of their organisational structure, workers' morale and Rahul's leadership? Karnataka New Government Formation Latest Updates: Signs of discord have begun to appear in the JD(S) and Congress alliance with party leaders struggling to work out a coalition formula that satisfies both parties' MLAs. To iron out the existing differences, HD Kumaraswamy is rushing to Delhi to meet Sonia and Rahul Gandhi ahead of government formation in Karnataka. Speaking to ANI, JD(S) chief ministerial candidate HD Kumaraswamy said he will prove his majority in the Assembly within 24 hours of swearing-in. Stressing on a "give and take equation" with the JD(S), Congress leader Mallikarjun Kharge said that the national party supported a regional party to "uphold Constitutional principles and democracy". On Saturday, chief minister-designate HD Kumaraswamy said a coordination committee would be formed to prepare a common minimum programme to implement the promises made by the JD(S)-Congress coalition. The oath taking ceremony is on 23 May where the new Karnataka Cabinet will be sworn in. Congress chief Rahul Gandhi, UPA chairperson Sonia Gandhi, West Bengal chief minister Mamata Banerjee, BSP chief Mayawati, SP chief Akhilesh Yadav, Andhra Pradesh chief minister Chandrababu Naidu, Telangana chief minister Chandrashekar Rao and other regional leaders are expected to attend the ceremony. A day after BJP's BS Yeddyurappa resigned before the floor test took place in the Karnataka Assembly, the new chief minister-designate JD(S)' HD Kumaraswamy confirmed he'll be meeting Congress chief Rahul Gandhi and UPA chairperson Sonia Gandhi on Monday. According to sources, senior Congress leaders Ghulam Nabi Azad and Ashok Gehlot will arrive in Delhi on Sunday morning and hold discussions with party chief Rahul Gandhi, before finalising the power-sharing arrangement with the JD(S) in the Karnataka government. 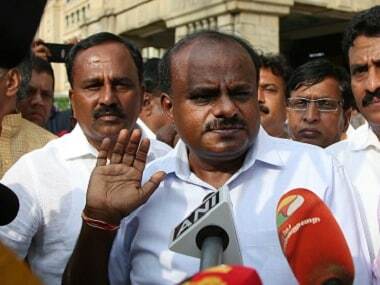 After meeting the governor on Saturday, chief minister-designate HD Kumaraswamy said his swearing-in ceremony would take place on 21 May. However, he later said the swearing-in would be held on 23 May as 21 May happens to be the death anniversary of former prime minister Rajiv Gandhi. With the fall of BJP's three-day-old government in Karnataka, HD Kumaraswamy heading the Congress-JD(S) coalition is set to become the chief minister for a second time on 23 May. Governor Vajubhai Vala today invited Kumaraswamy, the leader of Congress-JD(S) joint legislature party, to form the government. "On the invitation of the Governor I have met him on the basis of the request we had submitted on May 15 for the formation of Congress-JD(S) coalition government....he has invited us to form the government," Kumaraswamy, also state JD(S) chief, said. Talking to reporters after meeting Vala, he said the Governor has directed him to prove the majority on the floor of the House in 15 days but he would do it much before. After meeting the governor, Kumaraswamy had said the swearing-in ceremony would take place tentatively between 12 and 1.50 pm at Kanteerava stadium on 21 May. After a meeting with Congress leaders, Kumaraswamy said they also discussed about moving the confidence of motion on 24 May. He said he would meet Congress leaders Sonia Gandhi and Rahul Gandhi on May 21 to extend his gratitude to them. 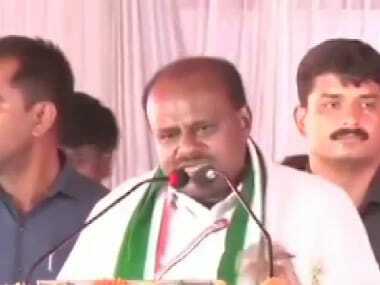 "I will also discuss how many Congress and JD(S) MLAs will become ministers," said Kumaraswamy. He said a coordination committee would be formed to prepare a common minimum programme to implement the promises made by the two coalition partners. 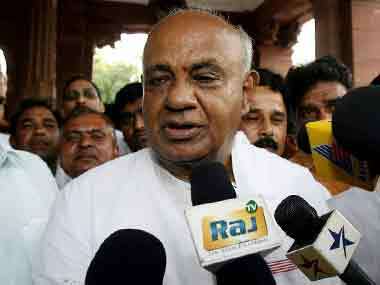 Kumaraswamy said there were no other discussions with the coalition partners other than winning the confidence vote. His meeting with the Governor came hours after B S Yeddyurappa stepped down as Chief Minister without facing the floor test in the assembly as the BJP fell short of numbers. 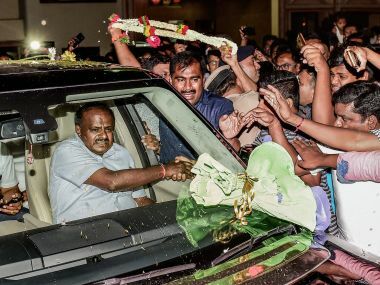 The post-election stitched alliance of JD(S) and Congress, which claims the support of 117 members, has already staked its claim to form the government and said it would be headed by Kumaraswamy. The third son of former Prime Minister H D Deve Gowda had earlier headed the BJP-JD(S) coalition government for twenty months from January 2006. Kumaraswamy said West Bengal Chief Minister Mamata Banerjee, BSP chief Mayawati, SP chief Akhilesh Yadav, Andhra Pradesh Chief Minister Chandrababu Naidu, Telangana Chief Minister Chandrashekar Rao and several other regional leaders would be invited for the swearing-in ceremony. Asked by when he will prove majority, Kumaraswamy said, "As soon as possible we will call the assembly session to prove majority... though Governor has given 15 days, we will not require that much time." Expressing apprehension that the BJP would again indulge in "operation Kamala (poaching on MLAs)", he said: "I'm aware of it that they will create problem. JD(S) and Congress leaders will take all precautionary measures for it." He also ruled out any kind of differences among the party cadres on alliance with the Congress.